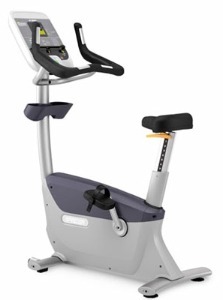 The Precor UBK 815 Commercial Series upright exercise bike features advanced ergonomics and KOPS biomechanics, a system that puts the forward knee directly over the ball of the foot when it is in the pedal spindle, for an optimum pedaling stance. The easy-to-read LCD console displays speed, time elapsed, time remaining, percent remaining, distance, resistance, RPM, calories burned, and more. The SmartRate® system displays your heart rate and helps you stay in a fat burn, cardio, or peak target zone according to your age and weight, which are entered before you begin your workout session. UPDATE: As of 2017 the UBK 815 and its sister recumbent bike, the RBK 815 are no longer available. Only the 615 and 835 series remain. 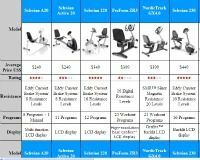 Read the reviews of the latest Precor models here. The Precor UBK 815 Commercial Series upright exercise bike features a two-stage belt drive system for an ultra-smooth operation. 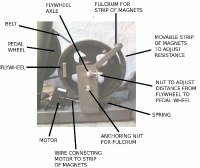 This design reduces maintenance as well as provides a whisper-quiet ride and 25 levels of resistance. The adjustable over-molded handlebars offer three riding positions: upright, cruising, and road. The dual-side pedals can be used with or without pedal straps, and the 170-millimeter crank arm accepts any standard road or mountain bike pedal. The upright exercise bike comes equipped with a 10.5-inch wide seat that adjusts to 14 positions and has a profile that tapers to a narrow nose. The seat post angle is 74 degrees with a 5-inch offset from the crank axle. 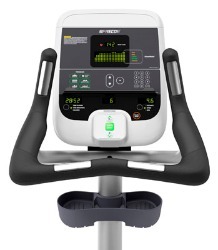 Along with the ergonomic seat, the Precor UBK 815 Commercial features Knee Over Pedal Spindle (KOPS) Biomechanics to place the forward knee in correct alignment in order to provide optimal comfort, an efficient pedaling stance, and to reduce the shear force on the knee. If you choose, you can also install your own saddle on the universal seat post for a more custom feel. At $3,095, the self-powered Precor UBK 815 Commercial Series upright exercise bike is an ideal choice for luxury homeowners who want the best equipment for their home gyms. The console layout is identical to the type you are used to on Precor elliptical trainers so you will feel right at home from the moment you begin to work out on it. For a club-quality feel at home, you can’t buy a better upright than a Precor. Get more info and special sale pricing on their latest bikes here!